Horses | Christian Horse- lover's Club Inc. This is HFR Josiah, our CHC mascot. Josiah is a registered Moriesian. He is about 2½ years old in this picture in 6/07. He is my dream horse, an answer to prayer! He is very playful and LOVES people so he enjoys his training time with us. It's all fun to him! He is named after my favorite king in the Bible, good King Josiah, because the king loved the Word of God and always did what was right in the eyes of the LORD. Josiah also means "the LORD supports." Breeding: I love Friesians, but they are so big and expensive. So I decided to buy a Morgan mare (I have always loved Morgans and breed it to a Friesian stallion with an excellent temperament. His mother is Singular Sensation (aka Fiesta), a black/brown Morgan mare out of Bethesda's Carbon Copy. His father is the FHS '03 Reserve Grand Champion, Sietze RV. What I liked best about Sietze is his high scoring (he received a 10 out of 10 for temperament), his more refined face and his beautiful movement. Another dream come true was that I was invited to ride Seitze! 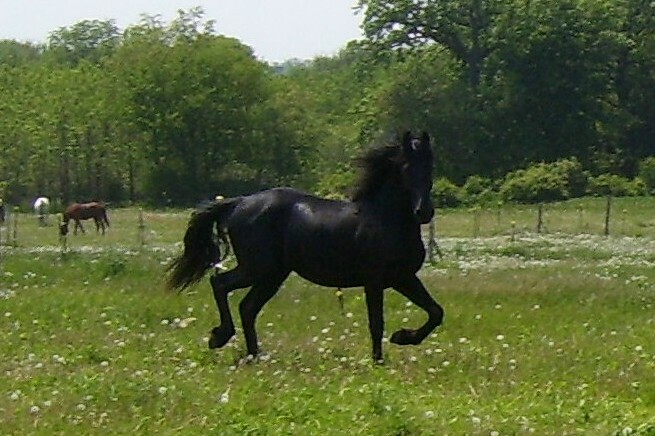 To ride a Friesian black stallion....wow! God is SO good!! Much CHC prayer went into choosing Fiesta's stallion and for a good, safe birth. Fiesta "took" the first try (a miracle for an 8 yr-old maiden mare). PTL! I (Kim) was privileged to be there at Josiah's birth and imprint him. He was strong! We did have a scare: at 4 days old he came down with "septic anemia" but we caught it very early. All the CHC girls prayed hard and our vet (Dr. Schwisow) worked hard and he was out of danger within a day. Again we praise and thank the LORD! Training: We have enjoyed working and training Josiah. 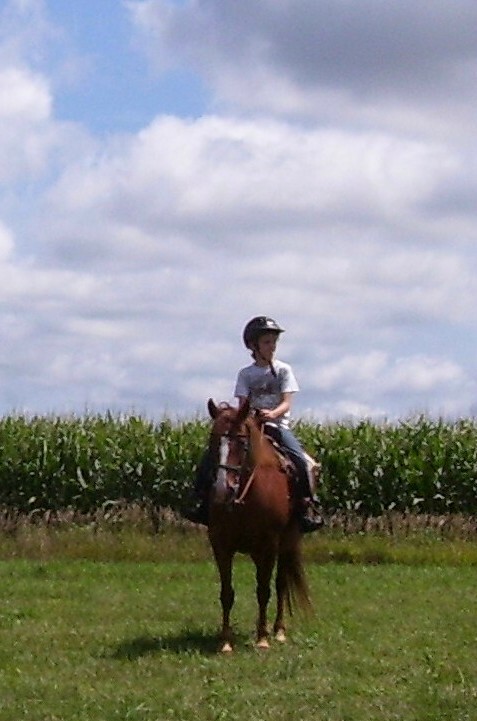 I ponyed him all over our woods since he was a weanling - till my accident. He was already in the Whitewater 2006 Christmas parade - carrying a gold present for Jesus. Josiah loved it all! He is very intelligent and a quick learner. We have been ground driving him in '07. He has been so cooperative that we even had our grandchild up in a saddle on him (safely). In 2008 we had him ground driving using a driving harness and we saddled him up with the girls who have been helping me. Ashley R. has been my training hands and feet. Geena R. has helped as we begin to ride him. He took to riders on his back like that is where they should be. He truly loves to "play" with us all. I groom him, lead him, lunge and "lunge for respect". I even round pen him from my Frontier electric wheelchair. For the past 3 years HFR Josiah has been in dressage training with excellent riding abilities of Danielle R. We have gone to Sorenson's Equestrian Park the past two years as we did the Introductory tests A, B, and C as well as, the Training level tests 1,2, & 3. He has excelled with all but one score (59.8) were in the 60's. He really showed a wonderful presence and only got friscky a few times. Since Danielle graduated and moved on Mikaela started learning dressage riding Josiah in her lessons. She worked with him for about a year and together we developed a very nice musical dressage presentation at her Graduation Ceremony in 2014. In fall of 2014 Katie R from the college has been taking lessons on him and in autumn of 2015 we have been teaching him to jump. He loves it too! I (Kim) have been happy to be able to ride him several times too! Future vision for Josiah: He will help in CHC activities, and maybe learn some jumping and reining moves so he can help in future CHC presentations. Foxy Lady is our dependable CHC pony. Foxy is our 13.3hh teaching pony. She is a great confidence builder, a very smooth ride for a pony and very lovable. 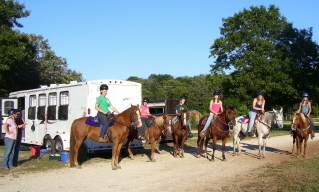 The picture on the right is Foxy and a CHC girl waiting to begin a trail ride for the Trust & Trails Unit -summer of '07. Foxy Lady as been around! She is actually a BLM mustang from Nevada! She was first rescued and trained by a boy and then through several others until a CHC girl bought her. When she outgrew Foxy we bought her, but not till after the both of them were very successful in showing (1st & 2nd place) at the state level. Foxy has also been in the Mid-West Horse Fair representing the BLM mustangs with her co-owner and the Mustang Pride club. She is our main CHC horse because she is great with beginners. She is patient, forgiving, tries to please, yet a bit lazy, so the rider needs to use the right cues accurately and energetically. Foxy is smart, sometimes too smart. When the CHC girls are practicing an exercise, by the 3rd time Foxy does it without their cues! When I use her for a regular lesson horse, sometimes I literally spell out what I want because she listens to my voice commands so well. Her one fault, like many mustangs, is she gets very nervous when it's very, very windy and gusty so we just don't use her when it's like this outside. Foxy loves trails rides! She is completely different -energetic! She really moves out, and when a gallop is on she races her heart out to keep up with the leader. (She doesn't really want to be the leader!) We believe she even has one "paso" type gait: it comes out when she is in a hurry and the rider keeps her collected. It is as smooth as silk, yet quite fast. trips. She is one of those priceless ponies! We thank the LORD for her faithful work in CHC. This picture is from a trail ride as we completed the TRUST & TRAILS Unit. We have gone to Southern Kettle Moraine Horseman's Park in WI. each time we do this Unit. Its one of my favorites! The last few years we have been using Fiesta in CHClub #1 activities. She is for the girls who move up from riding Foxy Lady. Fiesta is a very forward horse so the rider needs to be quick and confident rider. She has mellowed out since being a mother and now does a nice slow jog trot when asked correctly.